One of the areas that I get the most questions about is the use of the ISBN, the unique numeric identifier that’s used around the world to identify books. New self-publishers are especially concerned with making sure their books are registered properly, that everything is done so that their book can be sold without any problems or confusion. Because this area is specific to the book business, there’s a lot of confusion and misinformation about ISBN and how it works. I strongly recommend you use the resources provided by Bowker, the company responsible for ISBNs in the United States, on the ISBN website and at Bowker’s website. But even faster, without any further delay, here are 20 answers to the most commonly-asked questions about ISBN. ISBN stands for International Standard Book Number. It is a 13-digit number that’s used as a unique identifier for books. ISBN is used internationally. See my earlier article on decoding the ISBN. Why do we need ISBNs? We need them to identify each book that is published, and each edition of the same book. ISBN also identifies the publisher of the book. It is the standard ID number used to identify books by booksellers, libraries, book wholesalers and distributors. Should I get an ISBN? If you plan to sell your book in bookstores, to libraries, or through online retailers like Amazon.com, you will need an ISBN. Does a book have to be published to have an ISBN? ISBNs are issued to publishers, who then assign them to individual books. This can be done at any time, even before the book is written. Is the ISBN the bar code I see on the back of books? The bar code is a representation of the ISBN in a form that can be identified by scanners. The bar code might also have other information embedded in it, like the price of the book and the currency in which it is priced. Okay, do I need to have a bar code too? Only if you plan to sell your book in bookstores. If you only plan to sell online, or privately like at speaking engagements, you don’t need a bar code. Many publishers put them on their books anyway. 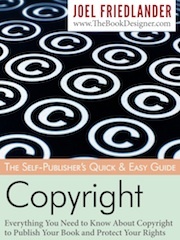 If I get an ISBN, does that mean my book is copyrighted? No, ISBN is administered by a private company for the use of the international book trade. Copyright is administered by the Library of Congress and is an extension of intellectual property law. If I have an ISBN, does that mean my book will be in Books in Print? Once you have an ISBN you can go to BowkerLink to fill out the forms necessary for your book to be listed in Books in Print. Can self-publishers get an ISBN? A self-publisher is still a publisher, so yes, you just apply for an ISBN like anyone else. Go to myidentifiers.com, the ISBN website run by Bowker, which is the only company authorized to administer the ISBN program in the United States. Click on “ISBN Identifiers” and you’ll be taken to a page where you can buy 1, 10, 100 or 1000 ISBNs. How many ISBNs should I buy? The least economical choice is to buy 1 ISBN. If you ever publish another edition of your book, or another book entirely, you will need more than one ISBN. I suggest you buy the 10 pack. A single ISBN today costs $125, while 10 ISBNs cost $250, 100 cost $575 and 1000 cost $1000. Note that the price per ISBN drops from $125 to $25 to $5.75 to $1. Isn’t it just a number? Why does a number cost $125? Many people are pondering this question, so far without an answer. Obviously, it’s not because of the cost of the product. Could there be another reason? Well, can I re-use my ISBN? No, sorry, once assigned to a book, an ISBN can never be reused. Where do I put the ISBN? You’ll print it on the copyright page, and it’s included in the Cataloging-in-Publication data block, if you use one. Otherwise, just print it on the copyright page and, of course, on the back cover as part of the bar code. I’m doing a print book and an ebook. Do I need two ISBNs, or can I use the same one? This is a matter of some discussion at the moment, since there are more and more electronic formats. The policy of assigning a separate ISBN to each and every edition is under review. Check back for more info. How about a hardcover and a softcover of the same book? You need a separate ISBN for each edition, to identify them for everyone who might want to find them in directories, catalogs and databases. If I revise my book, do I need to give it a new ISBN? If you only correct typographical errors, and don’t make any substantial changes to the text, you don’t need a new ISBN because it’s considered a reprint. A new edition would contain substantially new material, a major revision, or the addition of completely new elements. Anything that makes it a new book is likely to create a new edition and, therefore, need a new ISBN. How about if I just change the cover? You can continue to use the same ISBN, since the text has not changed. Well, there you have it. In 20 questions and about 5 minutes, you’ve overcome the confusion about ISBN. Have a question you didn’t see answered here? Ask in the comments and we’ll run down the answer. Takeaway: Getting the ISBN for your new publishing company is a necessary step to becoming a publisher and getting your book into print correctly. It’s not difficult once you understand how to do it. If I want to self-publish and buy an ISBN but then later want to publish the book with a publishing company, is that allowed? Do I use the same ISBN? Will a publishing company pick up a series even if it has been self-published originally? Priscilla, if a book has a new publisher, it needs a new ISBN. Yes, publishing companies sometimes do buy originally self-published books. please let me know is it ok only to have the ISBM AT the back cover only.I have not put it on the copy write page.but at the back only. will the book be scanned. I am printing a story about my father, a Holocaust survivor. I plan to give away copies to family but I would like to donate several copies to a Holocaust museum for them to sell to raise funds for operation. Do I need an ISBN? Barcode? Paula, anytime retail sales are involved, the book needs an ISBN. But if we’re just getting started (a 24-page collection of poems) and will only pass them out — free for now, maybe a $5 charge later but not through a store or online — do we need one? Since that’s not retail, right? I guess a local printed can make bound copies if that’s the case, correct? I recently ordered a 10 pack of ISBN’s for my upcoming book. I see the ISBN numbers listed on Bowker’s website (on my dashboard), but I was under the impression that I’d also receive them in the mail. It’s been roughly two weeks since the purchase was made. Am I misunderstanding something? Ernest, Bowker sends the ISBN list via e-mail only–no snail mail. Ok, I am such a newbie at this, but excited as my manuscript has been completely edited. So on to the next phase the book design. My book is also copy written with the Library of Congress. So, since, I’m self publishing my first book the ISBN, just one ISBN needs to be ordered or is it each book that is printed needs its own individual ISBN? So, if I wrote a different book for publishing, is this when I would need another ISBN? In addition, if I bought one ISBN number for my first manuscript that is all I need to identify that particular written manuscript for publishing? Which would be $125.00? Just want to know if I understood. Gina, the best step is to buy your own 10 ISBNs. That way they will be in your (publishing company) name and you’ll have them for any future products (books, ebooks, and audiobooks). Thank your for this awesome information source on ISBN’S. I purchased a 10 pack a few years ago but have moved my office and can not find my number’s. Is there a way to retrieve these with my name? Debra, see this article for how to reconstruct your ISBNs. They never wear out or go out of date! Did the cost of ISBN’s increase? Retta, they haven’t increased lately. I accidentally mistyped my title on Ingram Spark. My title contains two girls’ names and I typed them in the wrong order on Ingram. I used an ISBN purchased from Bowker. In addition to the hardcover version on Ingram, I am releasing a paperback of the same title (only typed CORRECTLY) on Create Space. I have not yet opened the channels for either version to appear on Amazon, but I wonder if I DO decide to add the hardcover version to Amazon in the future with the paperback, I fear the two books (even though identical) will have the two DIFFERENT titles in an Amazon search. MY QUESTION: Can I EDIT the mistake I made in typing the title on Ingram? So far I have only ordered some copies for myself. Julie, yes, you should correct the title mistake ASAP and only once that has been established, publish the other edition to match. Thank you so much for answering. I was able to change it successfully! How can I get a copy of my purchased set of ISBN numbers if I misplaced it? Or is there some way to look them up? Michael, if you got them through RRBowker, go to the site and try to login. They should be stored there for you. Hi, there! Thanks for sharing such an informative article. I have a book for sale that has a Createspace-assigned ISBN. I’m changing the ISBN to one that I own so I can sell the print copy through different distributors. So my question is: if the ISBN is the only significant thing that’s changing, do I need to change the copyright date from 2012 to 2018? Having already allocated an ISBN number to a book & successfully uploaded the book information onto the Bowker Identifier website, if I were to add “written and illustrated by” above my author name on the front cover, would I have to count this as a second edition and therefore need to use a new ISBN number? Particularly when this first edition already states on the Catalogue data page inside that I have both written and illustrated the book in question? Diana, if the same person is the writer and illustrator, then you wouldn’t have to get a new ISBN; if the writer and illustrator were different people and you were adding an additional name to the cover of the book, then I would get a new ISBN and call it a new/second edition. Thank you for the helpful advice, Sharon. I am about to publish my first book on create space and I have several other titles that I am publishing in the near future. I was advised not to use their free ISBN so that I would have all of the rights to my book. If I buy the set of 10 ISBNs can I assign each one to a different title or are they to be used on different versions of the same title (paper back, hard cover, e-book, etc.)? Also, if I buy an ISBN from Bowker does it come with a pricing bar code or do I have to purchase that separately? Yes, each book gets a new ISBN and each version of a book gets its own ISBN. Depending on how many books you have and how many versions of each you create, you might want to buy 100 ISBNs instead of 10. For example, if each of your books will have a print, ebook, and audio edition, that’s 3 ISBNs for that one title. If you have more than 3 books, you’ll need more than 10 ISBNs. Bar codes do not come with ISBNs; you have to purchase them separately. Prices of bar codes vary greatly–be sure to do your homework and price them from different entities so you get the best price (sometimes you can get them for free). Can you verify what was in Sally’s post? Does Amazon, for instance, own some rights to your story/book if they provide you with the ISBN for your book through their service? Can I buy the ISBN before the book is finished and do I need to submit a copy of the book to them in order to get the ISBN? William, you can buy your ISBNs anytime before the book is finished and you don’t have to submit a copy of the book to anyone to get one. I am publishing an e-textbook. With the book, the buyer is provided an online registration access code to view some accompanying content such as additional exercises, solutions, learning aids (eg flash cards and summaries), and videos as well as instructor aids – sample lecture slides, semester schedule, team projects. If we add/modify the accompanying content but do not change the textbook itself do we need a new ISBN? If the textbook itself is not changing in any way, you don’t need to change the ISBN. I am selling 2 volumes as a set = 1 book. How many ISBNs do I need? Tammy, I would recommend that each volume have an ISBN and the set have a different ISBN–for a total of three. If we have published a book in India and have an ISBN number for the same but intend to market the book in the US and UK market, do we need a separate ISBN and OCLC number and what is the procedure for the same? Hi. I have a published book with an ISBN number. It is on Amazon. The publisher has gone out of business. The book is stilling selling. Should I republish with a new ISBN number. Cynthia, you need to make sure you the publishing rights have reverted to you. Once you confirm that then you can republish it yourself (or via another publisher). If you want to publish it yourself, then yes you should buy your own ISBNs. Very helpful information. I am writing a multi-volume curriculum which I plan to self publish. Will I need one ISBN for each age group? Is there a way to identify that each volume is part of set? Davida, each volume will need its own ISBN. Gen, you need separate ISBNs for the print and ebook editions. I have a question. I self-publish on lulu.com. I recently added free -book versions of all my books. It didn’t hit me until today that I have the original ISBN written on a page that I devoted to the ISBN on the inside of the book than the newly assigned ISBN on the back of the book. Is this okay or do I need to change the ISBN inside each new e-book as well? Does the barcode on the Book have to be in a certain spot according to different states?? Eric, the barcode can be anywhere (left, middle, right side) at the bottom of your cover. If IngramSpark and CreateSpace will both have my paperback, can I use the same ISBN for their files? Or will I need a different ISBN for different printers? Thanks so much! Maude, yes, you can use the same ISBN for CreateSpace and IngramSpark. I have an ISBN and I’m not sure what information is associated with. I’m asking because my book is in the library. They used my ISBN to post the information about my book. There is no description and no book cover displayed on the library’s website. Is the description and book cover image things that are supposed to be associated with the ISBN or is there something else I need to do to get more details posted about my book. I believe that you update the metadata wherever you purchased the ISBNs. I bought mine through Bowker and filled in the info there.If you used a distributor like Ingram or Createspace, they would provide that info also so that is something to check also. Contact the library and they should be able to tell you what to do. I had the same thing happen to me when I donated copies of my books to two libraries. I’d like to purchase a packet of 10 ISBN numbers, but I need some EBook ISBN numbers too. To my understanding, regular ISBN’s is a thirteen digit number beginning with the 13: and the ten digit number, beginning with 10: can be used for an Ebook. If I purchase a pack of 10 numbers can I get supplied to me as five with the 13: and five with the 10:? Or will I need to purchase two 10 packs, one being ten 13 digits for my paperback books and ten being 10 digits to do those same books as ebooks? Linda, ISBNs are the same for paper books or ebooks. Buy a set of 10 and assign one to each different version of your book (for example, paperback, hardcover, audio, ebook) and you’re covered. This is an awesome article. Thank you so much for your effort. Number 14 had me crying tears. I needed that laugh, but I spit soda everywhere. Hi, maybe this is a silly question but I can’t find an official answer. Do I need to get a seperate copyright for each ISBN? In other words, I have seperate ISBN’s for hardcover, paperback and ebook. Does that mean I also need to get each version a seperate copyright? Aaron, if the text is the same in all versions (paperback, hard cover, ebook, etc.) then you only need one copyright for that text. Thank you Sharon! I know the paperback and hardcover are the same text and I believe all I did in the ebook was remove some of the text without altering so I should be good. Can I recieve booklets,published overseas without any ISBN in US for free distribution.? Yes, ISBN is only required for selling books through retail channels. Muhammad, you don’t need an ISBN if you’re just giving your book away to friends. You need an ISBN if you will be selling your book, especially if doing business with wholesalers, distributors, or retailers. Hi. I am re-covering my e-book. I will be self-publishing it so the publisher will be changing, along with the price. Do I need a new ISBN and barcode? Yes, you need a new ISBN and barcode. If I will be self-publishing my e-book, as opposed to how my book was originally published, do I use the original copyright date of 2012 or this year, 2018? All rights reserved. First edition 2009. The only thing that’s substantially changed in my e-book will be the publisher (me) and the cover. The body of the work is the same. When it comes to issues like trademark my first and best advice is to engage an intellectual property attorney who is familiar with trademark law. You need an expert to answer all of your very good questions. I’ve bought an ISBN but it’s not coming up when i search it or scan the barcode on other sites besides bookwire.com. How do i get my ISBN number to show up on other popular sites? If you own the ISBN, you should go over to myidentifiers.com to make sure all the metadata for the book is on record for that specific ISBN. I’m unclear from your e-mail whether or not your book is published; unpublished ISBNs probably don’t show up anywhere. I’m self publishing the book and the info shows up when I enter the ISBN into bookwire.com but I’d like it to display on other popular sites as well. Are there additional databases i can input my book information into to help the book show up on more popular websites? As a self-publisher, i’m trying to get my book to come up on more sites when people enter the ISBN. Can a writer remove the ISBN of his book as it is no longer in print? If so, how is it done? Tony, I’m not sure why you would want to remove it but sure if it’s out of print, you can remove it. As you may know, ISBNs cannot be used more than once. My company is self-publishing a book and using a local printer to print our books. How do we make sure the ISBN and barcode get printed on the book? Alice, whoever created your book cover file should be able to include the barcode (which includes the ISBN) on the cover. You can provide the barcode or the designer can. I am shortly to publish a book via Amazon’s print-to-order platform, CreateSpace. The book is co-authored with a US author, however I am in the UK. Do we need both a UK and a US ISBN? If I want to sell copies to bookshops in the UK do I need a UK-specific ISBN or are they international? Also, I was wondering about using CreateSpace’s own free ISBN (due to lack of funds right now). Are we putting a limit on ourselves by choosing this cheaper option? And can we change the ISBN number to our own one later on? Like ISBN’s, do separate versions of books need it’s own, individual bar code? The ISBN and the bar code always have to match. So if your book has a bar code it needs to correlate with the ISBN. What if I change the price of a physical book after it is published? Do I need a new barcode reflecting the new price? Or does an online retailer just adjust their price once my wholesaler – Ingram – informs them of the price change? Nikola, you need a new barcode reflecting the new price. And you need to change all your metadata (with Ingram, Bowker, etc.) too. We are producing, writing, a privately-financed multi-volume set of books, the first two volumes of which will be published by a known publisher this year, with others to follow. In fact, we’re just hiring the publisher to distribute the book sets. Depending on how the arrangement works out for the first set of two books, we may or may not continue with the same publisher for subsequent volumes. We’ve been offered free ISBNs by the publisher (presumably, one needed for each volume, right?). The critical question is, is there any ownership conveyed by an ISBN? Need we buy our own to maintain ownership or accept the free ones. And how should we copyright the entire multi-volume work? Dan, when you buy ISBNs, you own them. If the other publisher buys them, they own them. If this publisher is acting only as a distributor, it should not be supplying the ISBNs; you should buy them. And, yes, each volume should have its own ISBN. Regarding copyright, the copyright office has a terrific FAQ page that has lots of information to help you: https://www.copyright.gov/help/faq/. If the List Price of the book changes does that mean it needs a new edition or ISBN? David, you don’t need a new edition or a new ISBN but you will need a new barcode to match the new price (because your old barcode will match your old price). I already have an ISBN number for my children’s book. I’ve decided to make it into an ebook since in the past I’ve tried getting my books published physically with the ISBN I already have. Sine I am transitioning to ebooks, can I transfer my ISBN I already have digitally or do I need to purchase another ISBN? You need to purchase another ISBN. You need a different ISBN for each version of your book. For example, paperback, hard cover, and ebook = 3 ISBNs. Kareem, you need a new ISBN. You can’t transfer or reuse an ISBN. We are changing the book text just a little (less than 5% fixing typos, adding a short section at the end) But, we are changing the cover and the author name – going to a pen name. New ISBN? I have a similar question to Andrea. I got remarried and now have a new last name. I want to reprint my book and book cover with my new last name. Do I need a new ISBN? Andrea and Peggy, these are great questions. According to Bowker, a change from your maiden to married name will not require a new ISBN. Same with a change to a subtitle. Their guideline is that if a change is made for marketing reasons and there’s little/no chance of it creating confusion in the market, then you don’t need a new ISBN (like a new cover for instance). But if the change would cause confusion among buyers (“Is this the same book I already bought?”) then they advise using a new ISBN. I am printing, but not actually publishing, a Family History book. The book will NEVER be sold, and will be given as gifts to my family members only. I will be obtaining a copyright and then, having it printed by a POD site in hardcover. Do I still need to obtain an ISBN? SB, as long as the book will never be in a retail environment, you don’t need an ISBN. Thanks so much for your response, Sharon! Hi, I have a book currently available through a POD service. I now want to get a bulk order printed elsewhere to be sold in bookstores. Does a change in printer require a new ISBN or, as the only thing that’s changing is the location it’s being printed, can it keep the one already allocated? You don’t need a new ISBN if you’re going to change printers. And you don’t need to change anything else–unless for example, you’re printing outside the United States. Then you should change the notation on the copyright page (if you have one) that the book was printed in the United States. Now to find a good quality and priced printer in the U.K… Looks like a lot more have appeared in recent years, and I would imagine some of those don’t expect repeat custom. If you want to change the subtitle would that require a new isbn? Still confused. I’ve got my isbn number, do I have to purchase a barcode separately or does it come with the number? Simon, you also need a barcode but many are free. Here is one site: http://bookcovers.creativindie.com/free-online-isbn-barcode-generator/ where you can get them for free. Thanks for the link to the free barcodes! I was looking at the deal on the bowker site but didn’t seem like a deal to me. They give you more ISBN numbers than barcodes. I have a pack of 10 ISBN’s & have assigned half of them, & half remain unassigned (while I am writing the books I will assign them to). Question: how long can the un-assigned ISBN’s remain un-assigned (cuz I can only write so fast)…??? They’re paid for so I would hope there is no limit – OR do I need to rush… or does Bowker understand that creating works takes time – especially when there are 10 ISBN’s to assign. I went thru the Bowker site – both their Help files & their FAQ’s – and none have an answer. THANX in advance for your help. I have a book scheduled for release soon in both digital and hard copy format. I am wondering how I can make sure the online sales through my own website can be counted and how do I incorporate the ISBN # in the website to be tracked? Thanks in advance for any replies! Joe, trackers such as the New York Times, etc., do not include sales from individual/author websites in their numbers. Those entities usually only collect data from booksellers. No one other than you knows the sales numbers from your website. Barcodes?? I have spent $$$$ to get 275 copies of my book printed. They all have the ISBN on the front copyright page. I have some on consignment already, the owner there said nothing about barcodes. I went to another bookstore to make another consignment deal and the owner said I needed barcodes to sell them in his store. Before this, I had no clue from anyone, printers, bookstore owners, or anyone else that this was mandatory. I am getting a multitude of answers and none of them are clear. I don’t want to get a bunch of stickers printed out, put them on my books and find out they’re not good enough. Does this involve micromanaging with every bookstore I approach or is there a clear logical answer? Help!!!! Dave, having an ISBN (and a barcode, which is the scannable version) is needed to sell the product through retailers. You can either sticker the books with a barcode (with the price embedded) or reprint them with the barcode (if you’re doing a second edition or are using POD). Hi, just comparing the cost of obtaining 10 ISBN codes from Bowkers at a cost of $290 (why is it so expensive here?) and in the UK from Nielsen at the cost of around GBP 149. Would I be able to sell my books here in the US if I were to buy the UK ISBN codes, being that they are international book codes? Diana, the ISBNs should be issued by the country in which the publisher is located, regardless of where the books will be sold or the language in which they are written. Hi when you say ‘ISBNs SHOULD be issued by the country in which the publisher is located,’ what does that mean if I got ISBNs from Canada and used them in the USA? Are they still counted? Surely that isn’t illegal? If your publishing company is in Canada, then using the Canadian ISBNs are fine.